You’re at the grocery store, in the shampoo aisle. You’re scratching your head. No, you don’t have lice, you’re just trying to make a decision. A Cure for Head-Scratching: Frugal does instant price comparisons across different units of measurement. To your left is a sturdy, economy-sized bottle branded in military-stencil lettering with the words “Head Cleanser.” To your right, there’s a curvy little decanter with a label that reads “Aimez vos Cheveux” in an elegant-yet-perky script font. Head Cleanser sells for $42.79 for a generous 2.75 quarts. Aimez vos Cheveux will cost you $4.99 for a precious 236.5 milliliters. Which is the better deal? 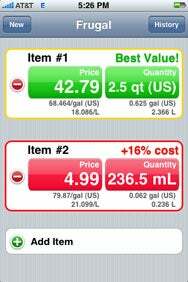 If you had Tidal Pool Software’s Frugal on your iPhone or iPod touch, you’d be able to figure it out in seconds. Frugal lets you compare two or more items in imperial or metric units in four categories: items, weight, volume, or length. Tap in the price and measurements on big, calculator-style buttons. Frugal takes what seems to be a mind-boggling conversion, such as the shampoo word problem above, and produces a common denominator to illustrate which price is best. It’s true that many stores provide this sort of comparison-friendly breakdown right on the price labels they put on the shelves. But not all of them do. And you’ve seen how often those stores’ cash registers ring up the wrong prices. Do you trust their calculations? Frugal also retains your past comparisons on a history page, although for some reason it only displays a summary of each. You can’t call up a past comparison and view it in full detail once it’s been relegated to the archives. Now let’s return to your shampoo dilemma. Frugal’s calculations tell us that Head Cleanser sells for $68.46 a gallon, while Aimez vos Cheveux sells for $79.87 a gallon. So if you’re value-conscious—and you don’t mind having hair that smells like the fragrant pink hand soap found in public washrooms—Head Cleanser is the winner. Frugal is compatible with any iPhone or iPod touch running iPhone 2.2.1 software or later.